Situated on the edge of the Cape Fear Coastline in between the bustling towns of Wrightsville Beach and Carolina Beach, the Masonboro Island Estuarine Reserve is a unique slice of undeveloped and natural barrier island shoreline that’s an important habitat for countless coastal species. Hard to reach but wonderfully isolated, visitors who make a trip to this literal deserted island will be rewarded with great shelling, beautiful landscapes, and miles of beaches to go around. 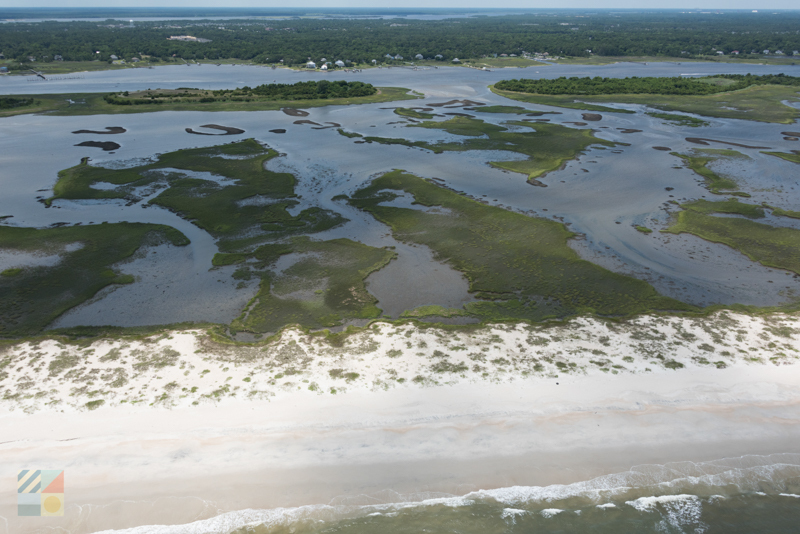 The Masonboro Island Estuarine Reserve is part of the NC Coastal Reserve and National Estuarine Research Reserve system (NCNERR), and is one of four National Reserve Sites (and 10 total sites) that fall under the Division of Coastal Management’s protection. The other three national sites are the Currituck Banks in the northern Outer Banks, Rachel Carson Reserve which is adjacent to Beaufort, NC, and Zeke’s Island which is situated just a few miles away. 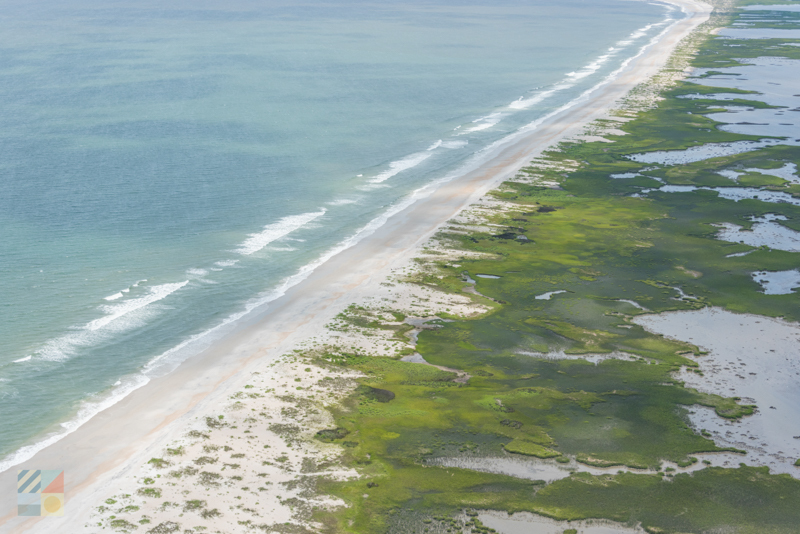 Masonboro Island is the largest undisturbed barrier island along the southern NC coastline, as well as the largest component of the NCNERR system. Comprising of a total of 5,653 acres, the island features 8.4 miles of beaches, as well as a wide variety of coastal habitats which includes salt marshes, subtidal soft bottoms, tidal flats, hard surfaces, maritime forest, shrub thickets, dredge spoil areas, grasslands, sand dunes, and ocean-facing beaches. The island is bordered to the east by the Atlantic Ocean, and to the west by the Atlantic Intracoastal Waterway. Masonboro Inlet separates the island to the north from Wrightsville Beach, while Carolina Beach Inlet serves as its southern water border. This natural setting and collection of varying ecosystems caters to a wide range of both common, migrating, and rare coastal residents. The island is a popular destination for loggerhead and green sea turtles to lay their eggs, and a wide variety of threatened or endangered species have been spotted at the site, including black skimmers, Wilson’s plovers, and least terns, which all nest on the island during the warm weather months. The rich Masonboro Sound waters on the western side of the island also serve as an essential nursery site for a wide range of popular local catches including spot, mullet, pompano, menhaden, flounder, and bluefish. As a result of this isolated and wild environment, visitors will be treated to a myriad of natural activities as well as some of the most scenic shorelines in the Cape Fear area. The tricky part about enjoying Masonboro Island Estuarine Reserve is getting there, but visitors will find a handful of options for reaching and enjoying this isolated barrier island. 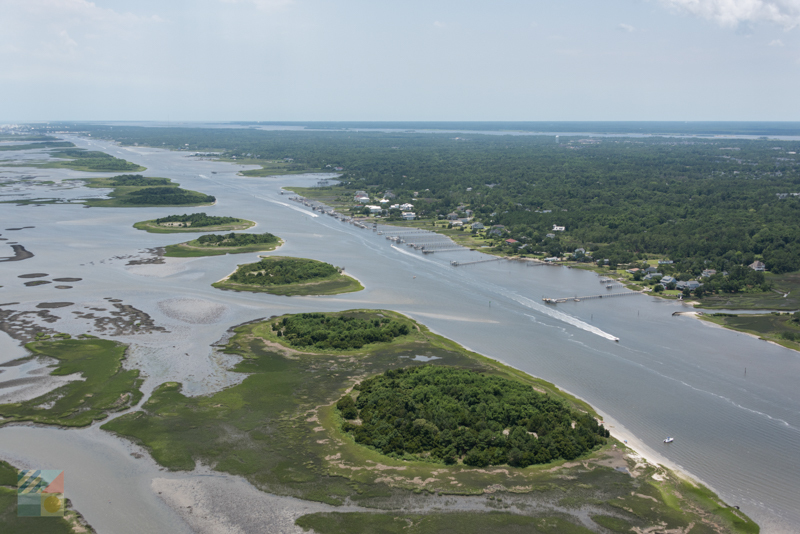 Masonboro Island Estuarine Reserve can only be reached by boat, and private boat owners (smaller vessels recommended) and kayakers can anchor or land on the beaches of the north or south sides of the island. From this spot, trails from the water’s edge lead across the island to the beaches, where visitors can walk along the shore for literally miles. Public boat launches are found in both Carolina Beach and Wrightsville Beach for visitors who want to cruise to the island. Visitors who don’t have a vessel will also find water taxi and / or tour providers available in Carolina Beach, Wrightsville Beach, and Wilmington. These “ferry services” can provide everything from basic transport to and from the island to full-blown adventures that can combine fishing, shelling, and even kid-friendly pirate treasure hunts. Contact individual charter or tour businesses, or local marinas in your vacation community, for additional options. Once on the island, visitors will find a wide array of ways to enjoy the incredibly remote and beautiful scene. Shelling - Masonboro Island is renowned as one of the best shelling destinations in the Cape Fear region, thanks to ample tidal flats or pools as well as its inherent isolated nature. Shell seekers will want to patrol the beaches around low tide to look for whelks, olive shells, moon snails, and even the rare Scotch Bonnets which periodically wash ashore. Fishing – There’s all sorts of great fishing opportunities to be enjoyed around Masonboro Island, which can range from the big speckled trout that make an appearance along the jetties of Masonboro Inlet, to the relaxed surf fishing with little beach competition. Inshore charter trips are also available of the surrounding waters, and visitors who are commandeering their own fishing expedition will want to ensure they have a saltwater fishing license in hand before casting a line. Birdwatching – Birdwatching is exceptional at this remote island destination, and wildlife fans will find a myriad of different species in every direction. Look for brown pelicans, white ibis, gulls, herons, terns and egrets along both the ocean and western facing shoreline, as well as rarer species including Wilson’s plovers, American oystercatchers, willets, eastern painted buntings, least terns and black skimmers on the sand. Kayaking – The western borders of Masonboro Island are a dream for paddlers, thanks to a network of salty channels that are on the borders of the heavily used Intracoastal Waterway, and which provide miles of wildlife watching and stunning scenery. Try to plan a trip close to high tide to ensure plenty of watery paths that are deep enough to paddle through, and watch for water moccasins and other local residents that frequent the area waters as well. Beaching - The beaches of Masonboro Island are simply stunning, and are ideal for swimming, surf fishing, splashing, surfing, and just enjoying miles of room to roam. Visitors should note that there are no lifeguards on the island, (and very few other people), and should proceed with caution as needed. Hiking – A small network of trails wind from the north and south sides of the island to the beaches, which present a nice slice of the local habitats that are found within the Masonboro Island Reserve. In addition, beach fans can walk the entire 8.4 mile length of the island along the oceanside for incredible Atlantic views throughout a sandy trek. Use caution on the western edge of the island, as the tidal pools and salt marshes are tricky and deceptively soft terrain. Photography – For gorgeous and undisturbed beach landscapes, there’s no place like Masonboro Island. Head to the local inlets – Carolina Beach Inlet and Masonboro Inlet – for a stunning on-the-water sunrise and / or sunset shot. Camping – Rustic camping is allowed on Masonboro Island! Visitors should note that the facilities are severely limited, with no public restrooms, amenities, power, etc. There are also strict regulations regarding litter, personal items, campfires, wildlife, pets, etc. 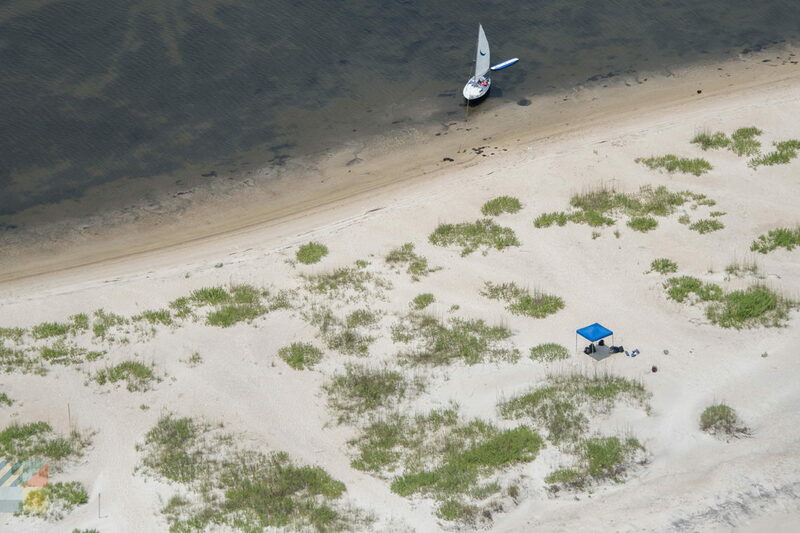 For more information on camping on Masonboro Island, visit http://portal.ncdenr.org/web/crp/camping-at-masonboro-island. While visitors can kayak to Masonboro Island, extreme caution should be used. Avoid the local inlets whenever possible to stay away from swift currents, and watch for maritime traffic of all varieties when crossing the heavily used Intracoastal Waterway. Pack lots of bug spray and sunscreen! With few human visitors, the mosquito population can be thick, so bug spray is all but required for a visit – and especially along the western regions and inland trails on the island, which are far away from the windy ocean beaches. Bring trash bags. Masonboro Island has a strict “take out what you bring in” policy, which helps keep the natural landscape inviting and undisturbed. This is especially essential if you are planning a full-day trip, or an overnight camping adventure. Dogs are allowed on Masonboro Island but MUST be leashed at all times. Personal property may not be left on the island for more than 48 hours. Beachcombers who want to find great shells will want to plan a trip a couple days after a hurricane or nor’easter has swept through the area or has passed offshore. Great shells tend to wash up on the beaches a couple days after a storm, after the winds and waters have calmed down. Be sure and bring everything you’ll need when you visit – including water, snacks, and supplies. There are no stores or development of any kind on Masonboro Island, so coming prepared is key. Fall is an amazing time to visit! The fishing and shelling are at their best, the “crowds” are light, and the mosquitos are not as prevalent. There are miles of paddle trails for kayaking adventures. Visit the reserve’s website at http://www.nccoastalreserve.net/web/crp/masonboro-island for a map of the trails on the western edge of the island that are ideal for natural explorations. Seasonal area closures may be present on the shoreline, due to bird or sea turtle nesting activity. Watch for posted signs and marked off areas, and proceed accordingly. Masonboro Island may be difficult to reach, but for beach purists, the fact that this island is somewhat inaccessible makes it a true gem along the Cape Fear coastline. 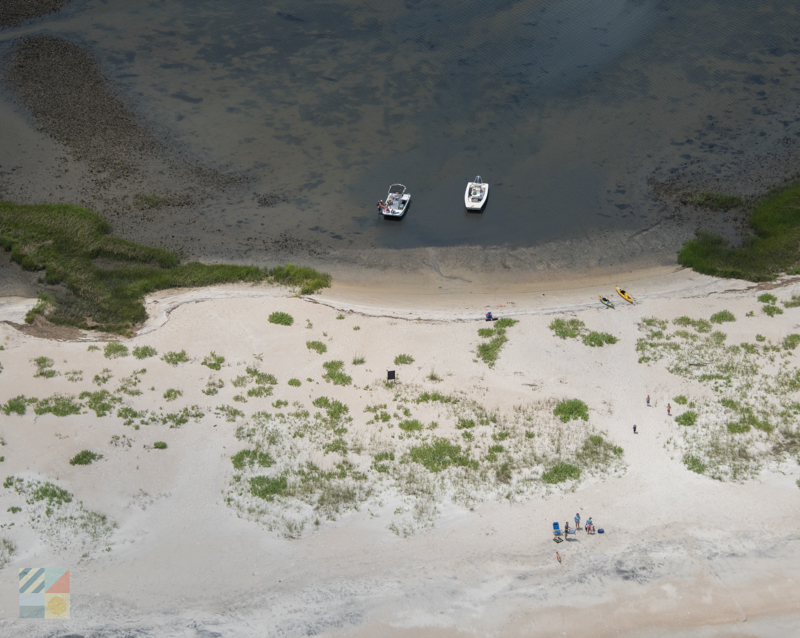 With beautiful beaches, great shelling, and a fascinating array of varying habitats, Masonboro Island is a true treasure for Cape Fear area visitors who like their seashore expeditions to be a little on the wild side.